Tim Cook, the man Apple co-founder Steve Jobs hand-picked to be his successor, may never surpass Jobs in panache or vision, but as a leader, he’s picking up right where Jobs left off. 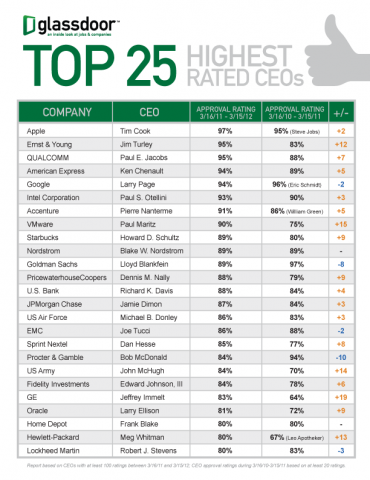 Indeed, after just 10 months, Cook already ranks as the country’s top-rated chief executive, based on sentiment within the company. And not just in tech — across all industries. 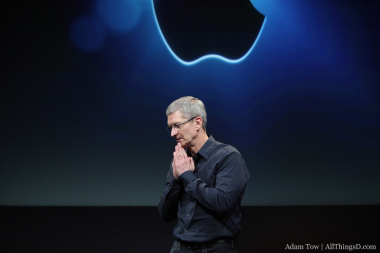 According to the anonymous Apple employee rankings posted to careers community Glassdoor.com, Cook has a 97 percent approval rating among the rank and file. That’s the same cumulative rating Jobs had when he stepped down as CEO — and two points better than the rating given him in his final year in that role. Not bad for a new CEO who’s following a guy with one of the most impressive legacies in tech. Clearly, Cook, who worked closely with Jobs after joining Apple in 1998, is intent on hewing to the vision of his predecessor, while putting his own mark on the company as well — instituting a charitable matching program for employees, for example. And according to Cook’s employees, he’s doing exactly that. His 97 percent ranking placed him ahead of not only Qualcomm’s Paul Jacobs and Ernst & Young’s Jim Turley, but Google’s Larry Page and American Express’s Ken Chenault, as well.